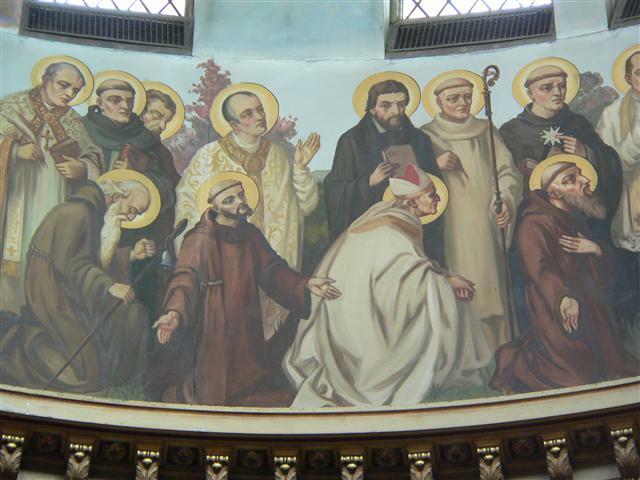 St. Alphonsus Liguori (1695-1787) and St. Ignatius of Loyola (1491-1556), whose feast days we celebrate this week, are both depicted in a in a group of twelve figures identified as “Monks, Hermits, and Religious” in the dome of our church. St. Alphonsus, the first standing figure on the left, is pictured with a pen and book. Although he acquired fame as a writer, the founder of the Redemptorist Congregation is also remembered for his preaching and pastoral reforms. His feast is celebrated on August 1. St. Ignatius, fourth from the left (standing), was on his way to military fame before a debilitating war injury. His conversion experience began during his convalescence, and his writings during that time culminated in his greatest work, the Spiritual Exercises. Founder of the Jesuits, his feast day is July 31. The dome painting is by Buffalo-born artist Joseph Mazur; the photo by Gary Kelley. *Now that school is out for the summer, please remember that we have instituted age restrictions for admission to Bingo in response to requests from our players. As of October 15, 2015, we no longer admit children under 8 years of age. We now have a Bingo camera with TV monitors and electronic verification! and progressive numbers for this week, click HERE and visit our Facebook page. Ladies Sodality ~ Officers and directors are reminded of our board meeting on Sunday, July 31, following the 10 AM Mass. Agenda includes plans for August 2 “Summer in the City” picnic and scheduling programs for the coming year. Lunch will be served on the front porch of the rectory. 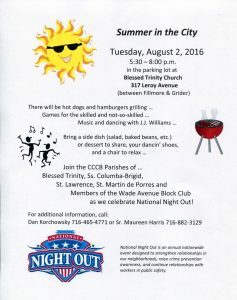 CCCB Summer in the City ~ On Tuesday, August 2, from 5:30-8 PM, we will be celebrating “National Night Out” at Blessed Trinity. It’s your chance to enjoy a summer evening with parishioners, neighbors, and friends from the other CCCB parishes. Beside a picnic supper, there will be games for the skilled and not-so-skilled, and J.J. Williams will be providing music for your listening and dancing pleasure. Even if you are not able to prepare a side dish or assist with setup, our grill men still need to know if you are planning to attend. If you haven’t already, please SIGN UP THIS WEEKEND! And it’s not too late to volunteer. There are sign-up sheets on the altar rail near Our Lady’s shrine. Then bring your folding chair and join us on Tuesday night. For last minute info, contact Daniel Korchowsky at 716-465-4771. Full-time Position Available ~ We are still hoping to bring on a new custodian before Jerry Gallisdorder leaves in September so that he can show the new person around and train him/her in the basic tasks of the job. If you know of someone qualified for the job, please have him/her submit a resume to the rectory as soon as possible. Weekly Highlight from Faithful Citizenship: A message from Sister Maureen Harris ~ How does the Church Help the Catholic Faithful to speak about Political and Social Questions? Again, just a few highlights from Part 1 of A Well-Formed Conscience concerning this issue: (To read the entire document, visit www.usccb.org/issues-and-action/faithfulcitizenship/upload). #19 The Virtue of Prudence – The Church fosters well-formed consciences not only by teaching moral truth but also by encouraging its members to develop the virtue of prudence. (Prudence enables us “to discern our true good in every circumstance and to choose the right means of achieving it” – Catechism of the Catholic Church). #20 We have a responsibility to discern carefully which public policies are morally sound. Catholics may choose different ways to respond to compelling social problems, but we cannot differ on our moral obligation to help build a more just and peaceful world through morally acceptable means, so that the weak and vulnerable are protected and human rights and dignity are defended. Serving Older Adults in 7 WNY Counties ~ Catholic Charities strives to assist the community through various stages of a person’s life, including as an older adult. There is the seven-county Alzheimer’s Disease Caregiver Support Initiative offering education and resources, Project HOPE for care coordination, telephone assurance programs, friendly visitor programs, A Gathering Place in Buffalo with weekday socialization for adults age 60 and older, and the Foster Grandparent Program offering eligible seniors the chance to work with young students. For more information about which services are offered in your area, call 716-896-6388 or your local office. 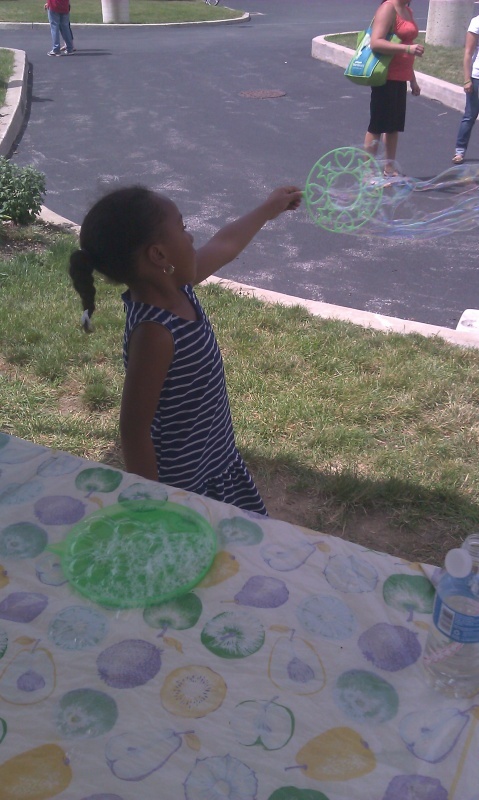 For more details on other adult programs or any of our services, visit http://www.ccwny.org. You can also find us on Facebook, Twitter and You Tube. Rectory office hours are Tuesday-Thursday from 10:30 AM – 2:30 PM. Please call our secretary, Barbara Sercu, at 716-833-0301 if you have information for the bulletin, changes to your phone number or mailing address, or would like to register as a parishioner. Our Helping Hands Food Pantry has extended its hours and now operates on both Friday and Saturday mornings from 9 AM – 12 Noon. If you are interested in volunteering, contact Luis Clay at 716-812-3461. Tuesday, August 2, at BT! Uptown Fresh ~ A Healthy Lifestyle Market featuring fresh fruits and vegetables is now taking place every Saturday from 10 AM – 2 PM at the corner of Bailey and Dartmouth in Buffalo. It began operation on June 25 and will continue every Saturday (except Labor Day weekend, Sept. 3) through September 24. Our Lady of Victory Annual Pennies to Heaven/6th Lawn Fete ~ 767 Ridge Road, Lackawanna, in Shrine parking lot. Saturday and Sunday, August 6 and 7. The event opens on Saturday at 5:30 PM. Food tent, beer tent, games of chance, silent auction, theme baskets. Treasure Chest (filled with lottery scratch-offs) raffle. “Wine Shelf” sure winner, children’s activities, bounce house and obstacle course, bell jar and split club raffles. Music provided by “Flipside” beginning at 7 PM. The day ends at 11:30 PM. On Sunday all activities continue and the “Kokomo Band” performs at 1 PM. Chicken Barbecue will take place from 1-5:30 PM serving Chiavetta’s chicken. Tickets are $11.00/adults and $6.00/children pre-sale. After July 24 they go up! Raffle prizes include an iPad Pro, airline vouchers for two, theater package, casino trip for two and more. Tickets are $1.00 each or a book of 15 for $10.00. Winners’ names will be drawn on Sunday, August 7, at 5:30 PM. We hope you will join us. Call 828-9444 for more information. Burgers, Brews & Blues ~ The Sisters of St. Francis of the Neumann Communities will host their inaugural “Burgers, Brews & Blues” on Tuesday, August 16 from 5-9:30 PM at St. Mary of the Angels, 201 Reist Street, Williamsville. A performance by Janice Mitchell and the Jim Beishline Trio will highlight the event. The evening will include a social hour, dinner and live music. For additional information, call 716-632-2155 x687 or email cmunschauer [at] sosf [dot] org. September Concert ~ The Evangelization Committee at St. Martin de Porres (“SMDP”) is sponsoring The George Scott Big Band in concert at the church on Saturday, September 10 from 5-7 p.m. Tickets are available for $10. Tickets purchased before August 22 will be eligible for a $50 cash drawing! Please call the SMDP office at 883-PRAY for further information. “Griefshare” Support Group to meet at Our Lady of Pompeii Catholic Church ~ If you’ve experienced the death of a loved one, or know someone who has, please consider joining us on September 21 at 6:30 PM in our Ministry Center, 129 Laverack Avenue, Lancaster, NY. A different DVD will be shown on two Wednesdays of each month on how to cope with grief and loss. Coffee and an informal discussion will follow. Call Sister Joyce to register at 716-683-6522 x103.